58 year-old female with right upper chest lesion. She has a history of inflammatory breast carcinoma. 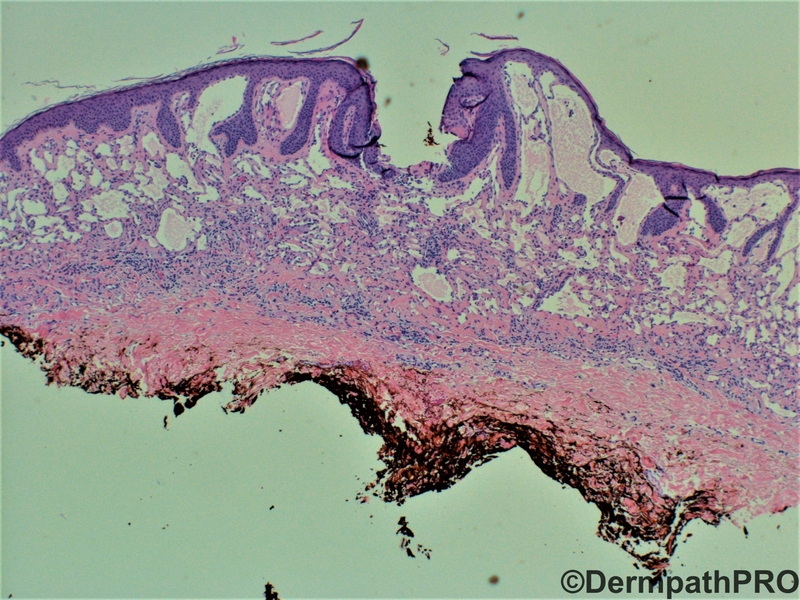 Clinical differential diagnosis: nevus versus seborrheic keratosis versus other. 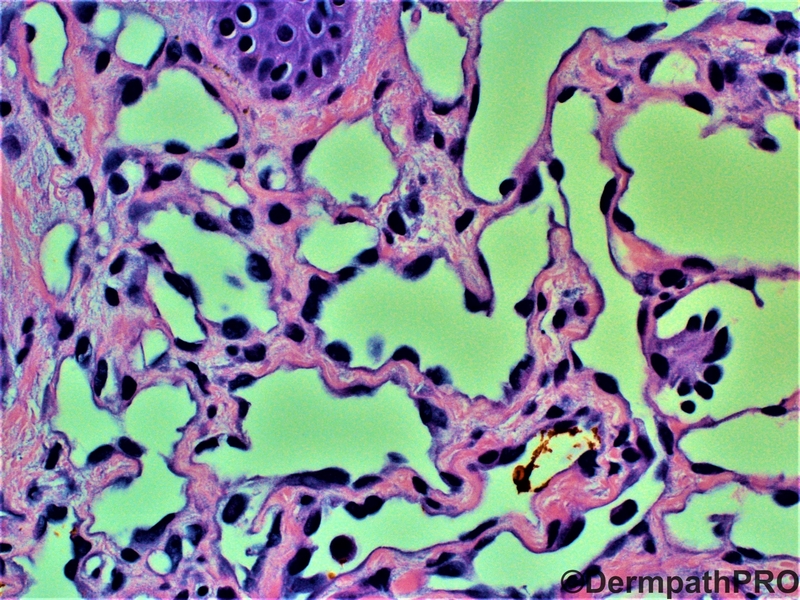 Hobnail hemangioma. I sometimes run HHV8 to make sure it is not Kaposi, because the lower portion of hobnail hemangiomas show slit-like vascular channels, almost spindle looking. 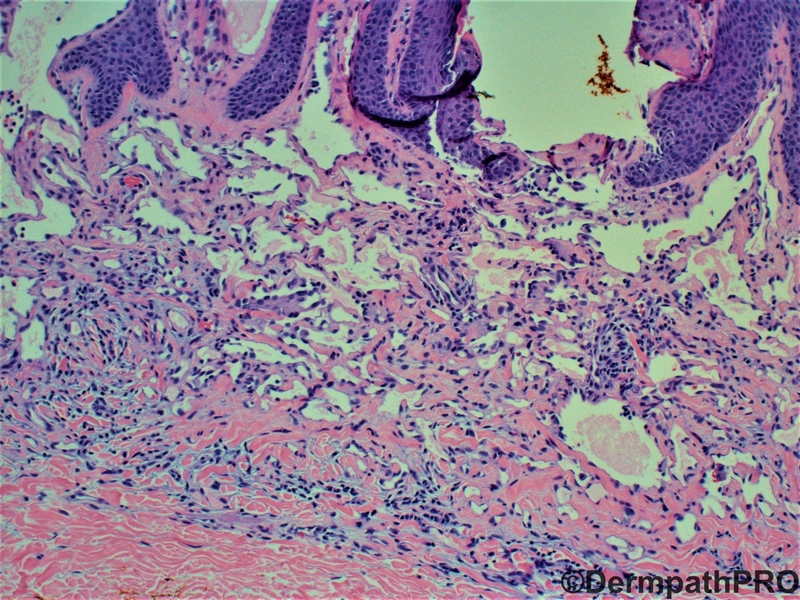 Hobnail Hemangioma (targetoid hemosiderotic hemangioma). 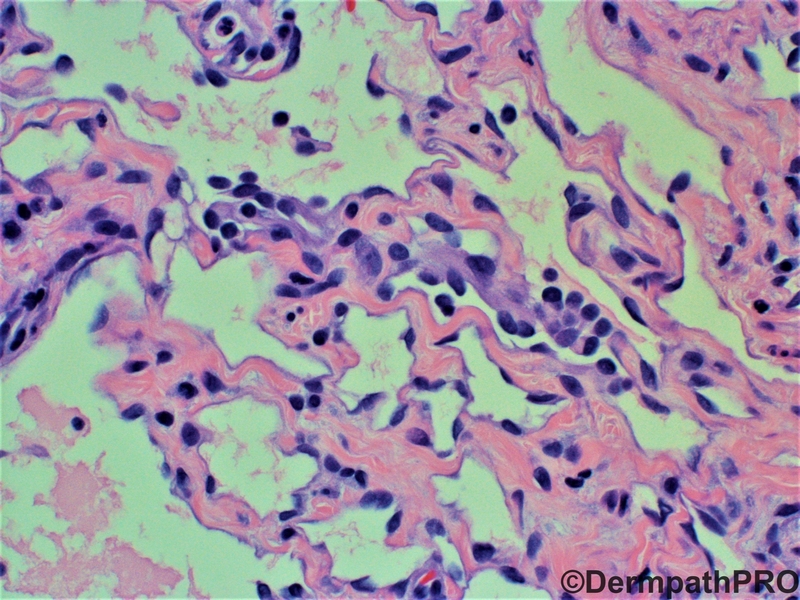 Dilated superficial vessels with hobnail endothelial cells, papillary tufts in superficial vessels, CD31 and D2-40 positive, CD34 negative. DD. 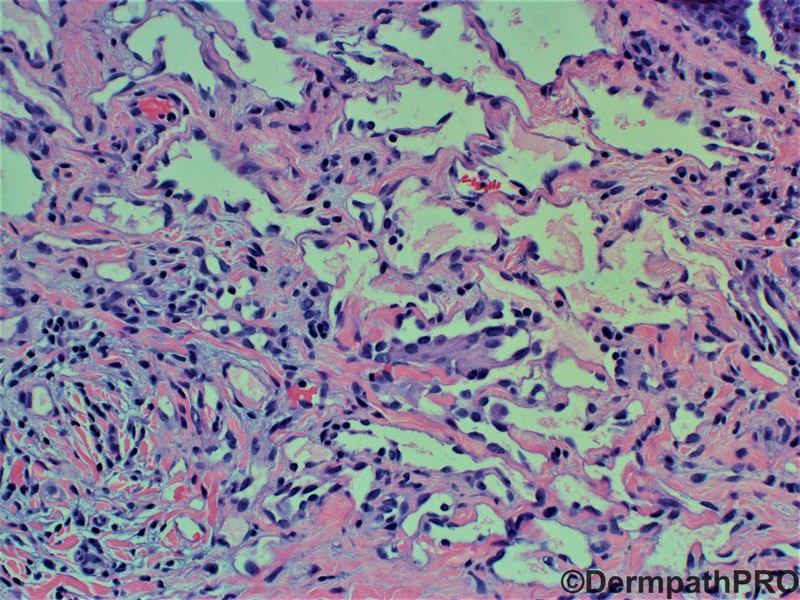 K. Sarcoma and Retiform Hemangioendothelioma. Yes. Hobnail hemangioma is a good thought. But I'm kind of concerned about the possibility of Atypical Vascular Lesión in the setting of prior radiotherapy. Yes, agree with HH!!! Nice biphasic pattern: superficial areas with dilated irregular vessels, some of these with papillary endoluminal Dabska-like projections. Deep areas with compressed spindle cell bounding slit-like vessels. Nice case! For me first hypothesis = atypical vascular lesion. Was the patient treated with radiotherapy? We do MYC by immunohistochemistry routinely in this kind of cases. Yes, the patient received radiation therapy. Atypical vascular lesion. Excellent point and excellent case! Upon further study it appears that atypical vascular lesion is known to sometimes show biphasic pattern as seen in hobnail hemangioma. The lack of hemosiderin, the lack of extravasated erythrocytes and the radiation history would favor atypical vascular lesion. Yes. I was wrong. After Raul’s comment, I was reconsidering the clinical-pathological features and changing my diagnosis!! !